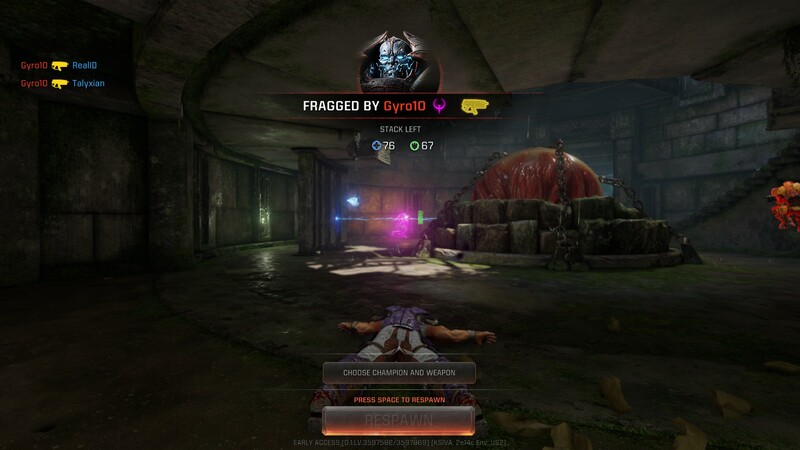 You know, I find myself surprised that Quake Champions isn’t that bad. I thought it would be a big pile of junk. And while it is in Early Access still, it feels like an actual game, albeit one with a lot of stuff locked behind a paywall. And I won’t be spending a cent on it. 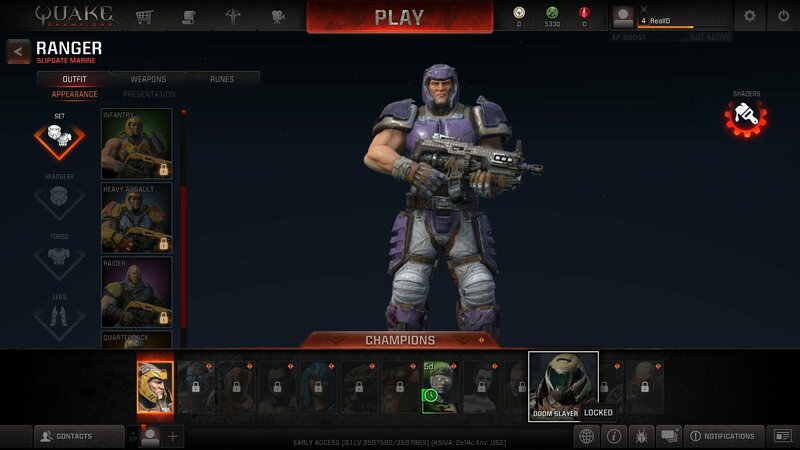 I only have the default champion unlocked, the Quake 1 Ranger. It’s nothing too impressive, and I kinda think his face looks like a lump of playdough, so it’s a good thing I don’t have to stare at it. He has a teleport ability- you throw out an orb(moving slightly slower than a rocket), and you hit the same key again(default f) and you instantly teleport to that location. I’m sure that in the right hands, it can be a real asset, either getting you out of a tight spot or allowing you to reach an out of the way area. However, in practice, I don’t find it terribly useful. At least, not for me. For one, I constantly forget about it. Because I’m an old fart, I still play the game like it’s Quake 3, meaning I just run and strafe and fire, with no time to play around with cutesy abilities. For another, I think I play with my mouse sensitivity set too low for it, since I try to teleport behind someone, but I get wiped out before I can spin around, since the teleport keeps your orientation. That means, if you try to throw it behind someone, you’ll teleport with your back to them, facing who knows what. And then I get fragged. Really, though, the game just feels too fast to be able to use an ability like that. It really does feel like old school Q3 in that respect. Player movement is swift, and the frags happen just as swiftly. The graphics are fine. I mean, in this day and age, graphics have all reached a certain level of fidelity, and they all just blend together for me. The sound is nice and meaty, and even the f2p nonsense like lootboxes is viscerally enjoyable. 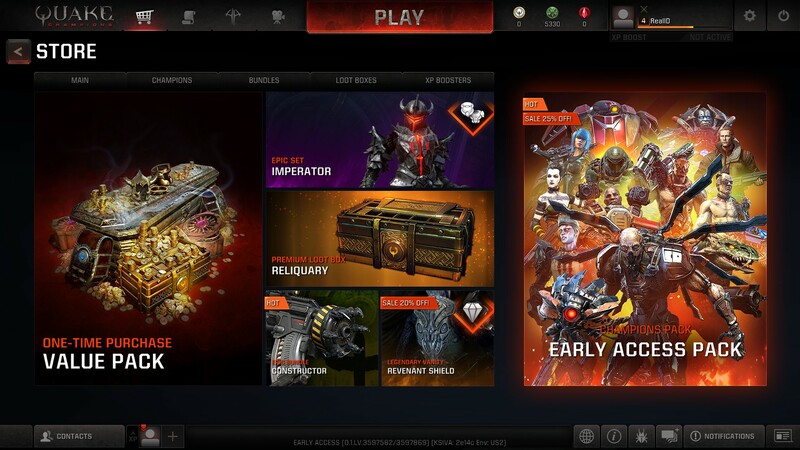 However, at the end of the day, it is a free-to-play game. That means lootboxes, that means content locked behind paywalls, that means a certain imbalance in the rate of unlocks. 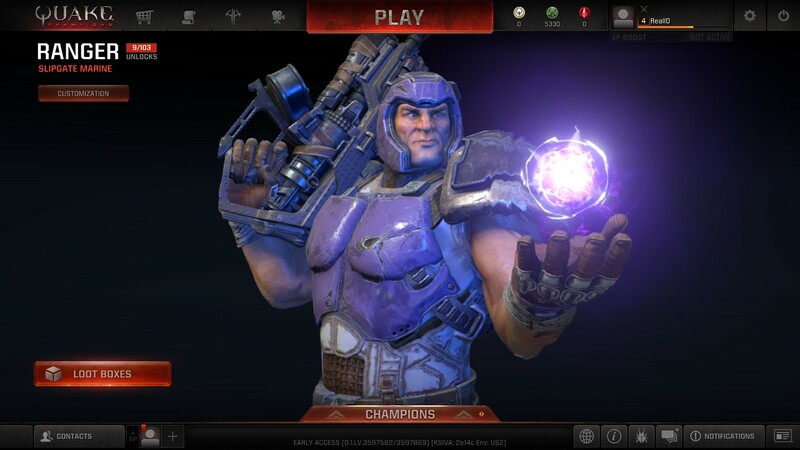 I don’t even really like the Quake Ranger. 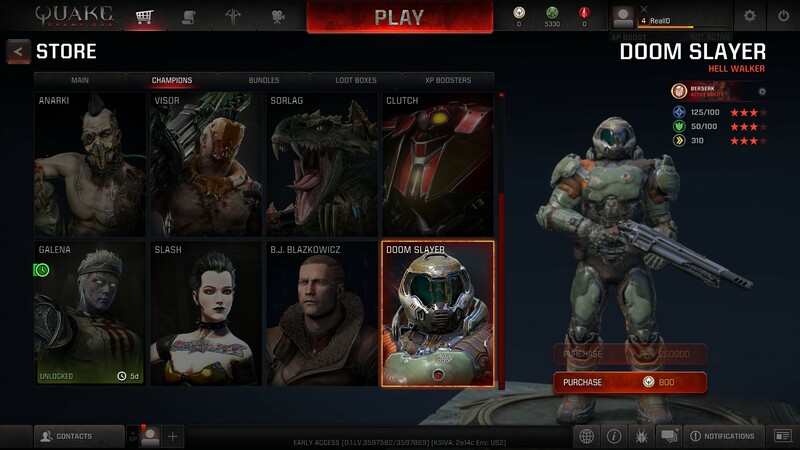 I’d much rather play as BJ or Doomguy, but I have to plop down real money, or accrue 250000 game credits to unlock just one. And then there are all kinds of different models and textures for everything from your helmet, to your weapon, to your entire character model. And it still has periodic free champions and lots of unlockable stuff. But it’s all built around a decent and enjoyable deathmatch experience. 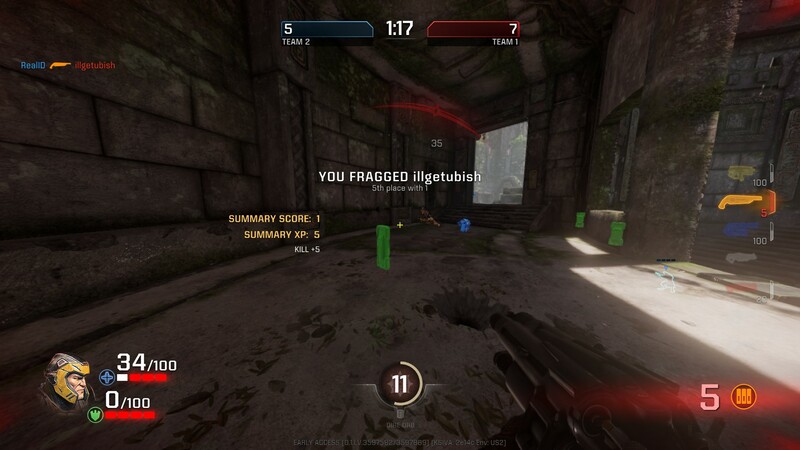 It’s a strange one, Quake Champions. Even with just the default loadouts, you can have a lot of fun, engaging in classic Quake gameplay. But it’s all packaged with stupid F2P stuff like lootboxes. In general, I don’t like to support F2P first person shooters, but since Quake Live didn’t really catch on, is now $10, and last I played, didn’t support mods, it feels like one of the only games in town. 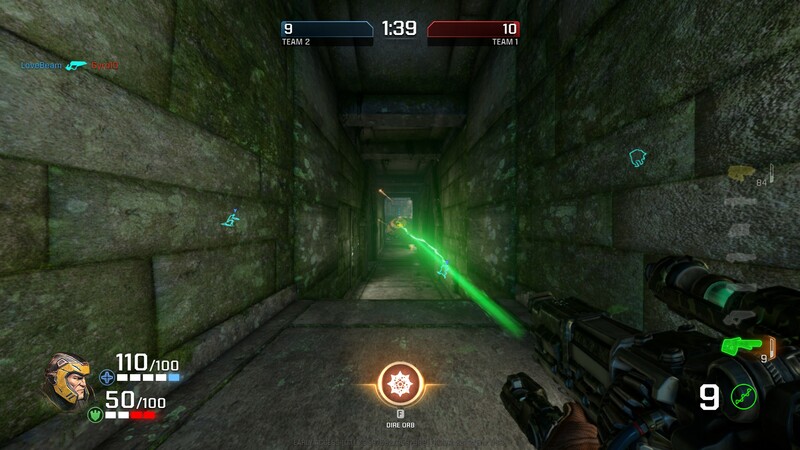 Hmm, I wonder of Unreal Tournament is doing. . . .? Posted by Narzack on July 6, 2018 at 11:19 PM | Get some!